Van Alst Playground, adjoined to P.S. 171 and bounded by 14th and 21st Streets, 29th and 30th Avenues, is named after Peter G. Van Alst. Born in Dutch Kills (“kill” means “stream” in Dutch), Queens on May 28, 1828, Van Alst received his education at the District School and the Astoria Institute. He apprenticed as a surveyor for a few years, and worked independently until 1872, when the city legislature appointed him to serve as a commissioner, surveying and supervising the construction of several roads in Long Island City, Queens. In 1874, Van Alst and three fellow Long Island City citizens comprised the First Ward Improvement Commission, which was in charge of raising the grades of Jackson Avenue from Vernon Avenue to the courthouse from three to eight feet, which profoundly affected the daily life of the city. Van Alst’s job consisted primarily of constructing maps, which revealed detailed organizations of street lines, grades and sewage lines of the Long Island City area. The Van Alst family was a large extended family, whose members lived in various parts of what is now Queens, from East Elmhurst to Woodside and Dutch Kills. Legend has it that the prominent farming family moved to the area in the early 1700s and resided there until the 1870s, when they dispersed and moved elsewhere. Their Dutch family name was perpetuated in the naming of Van Alst Street, until it was renamed 21st Street, and now in the naming of this playground. Van Alst Playground is located in the section of Long Island City that is called Astoria. The area was known as Hallet’s Cove in the eighteenth century until it was developed in 1839 by Stephen A. Halsey, a fur merchant who petitioned the state legislature to name it after the prominent fur trader John Jacob Astor. The residents agreed to change the name in the hopes that Astor would donate money to the village’s young ladies’ seminary. He eventually sent $500. In 1870, Astoria and several other Queens neighborhoods, including Hunter’s Point, Steinway, Blissville, Dutch Kills, Bowery Bay and Ravenswood consolidated to form a single entity. Officials debated a name for the new union, and finally agreed on Long Island City, after the newspaper that had started operation there in 1865, the Long Island City Star. In 1943, the City of New York acquired this property for the Department of Education. Soon thereafter, the city built Peter G. Van Alst Public Elementary School 171, which has a capacity for 1,361 pupils. On July 22, 1948, they drew up plans to build a jointly operated playground on the leftover land. P.S. 171 opened to students on February 5, 1952, and on October 28, 1952, the city hosted a dedication ceremony at the school, in honor of Peter Van Alst. Known as Playground 171, this facility opened on July 10, 1957. 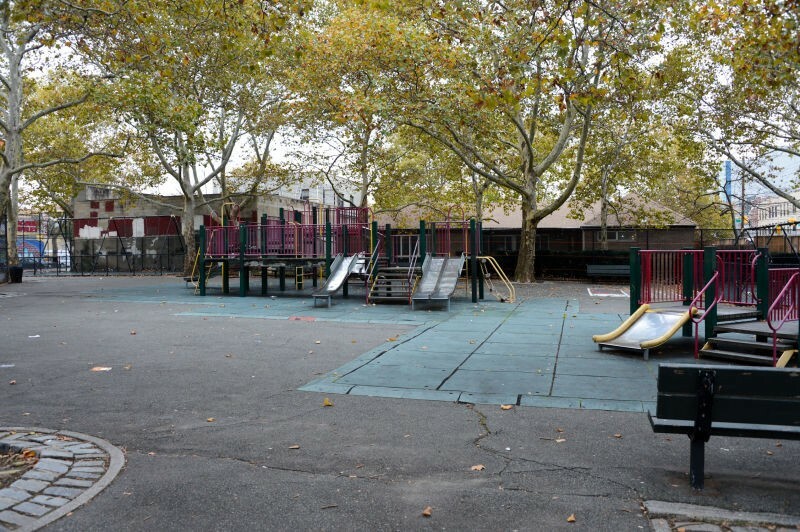 Although these grounds are officially under the jurisdiction of the Department of Education, Parks is responsible for maintaining the playground. In 1985, Parks renamed this playground Van Alst Playground. 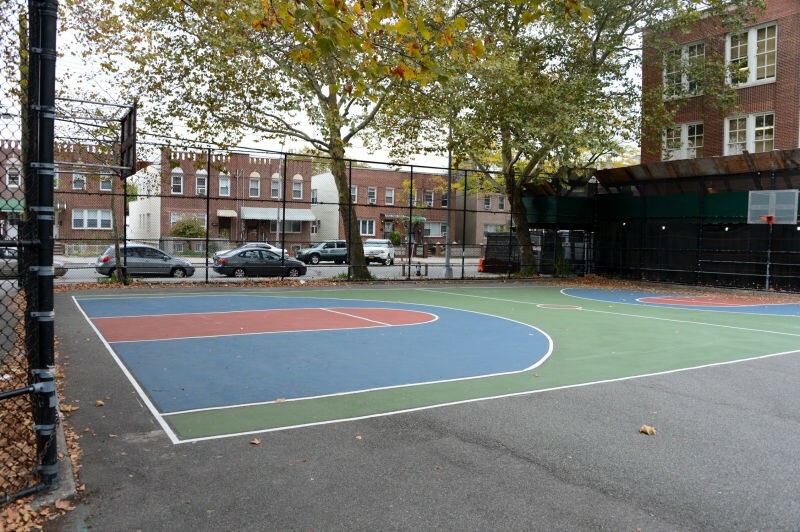 Van Alst Playground is equipped with several basketball courts, two jungle gyms, swings, sitting areas with benches and game tables, a water fountain, a flagpole with yardarm that flies the United States, City of New York and Parks flags, and a plethora of London plane trees. 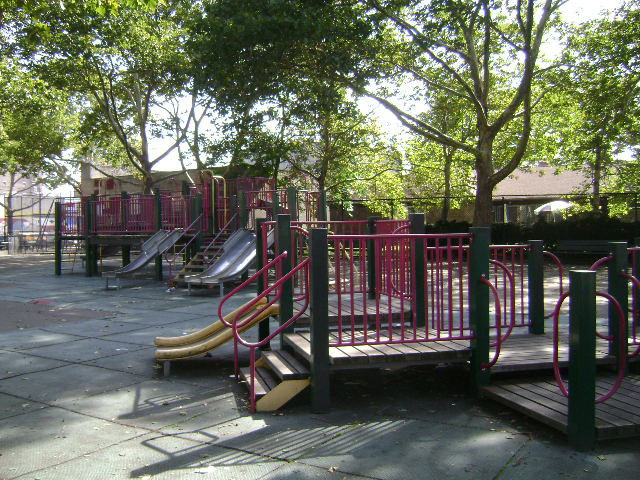 In 1998, Council Member Peter F. Vallone allocated $15,000 in funds for a partial reconstruction of Van Alst Playground.